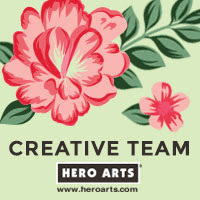 Hello there, today we are celebrating the release of the March My Monthly Hero Kit from Hero Arts. It is wonderful! It can be used for so many occasions. If you are following along in the hop, you should have arrived here from the fabulous Jessica, but if you get lost along the way, the full list of participants is below. 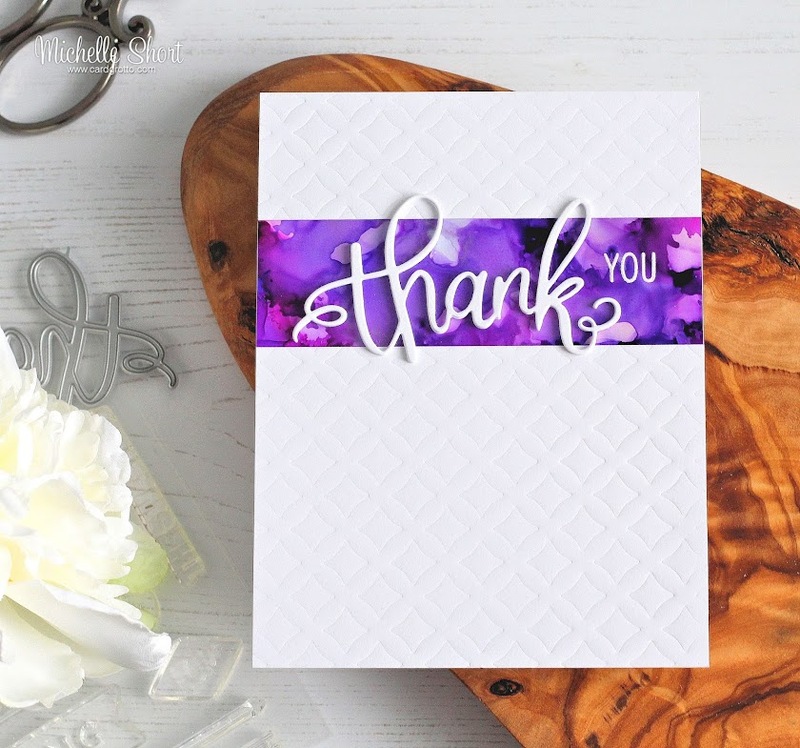 For my card, I started off by cutting the 'thank' die from the kit three times from white cardstock. I layered these up with liquid glue to create a thicker piece. I love the fonts on these word dies! I then created a base for my die-cut to sit on. I took a piece of Yupo paper and first added on a layer of Cool Peri and Shell Pink Alcohol Inks. I spritzed air on to the piece with the Distress Spritzer and then added a layer of Raspberry and Purple Twilight Alcohol Inks. To finish off, I added in a few drops of Silver Mixative and blended this in with the Alcohol Ink Blending Solution and the Spritzer. This piece was set aside to dry. Once dry, I cut it down in to a strip. I applied a generous coating of ant-static powder to it and then stamped the 'you' from the main kit stamp set using Versamark Ink. I applied white embossing powder and heat set. This was added to a white A2 card base with tape runner. I took a panel of white cardstock and ran this through my die cutting machine with the Bold Graphic Confetti Fancy Die, which is available as an add-on this month. I decided to emboss the die instead of cut it and it gave a lovely pattern on to the panel. I cut it down and added one piece above the alcohol ink strip and one piece below. The 'thank' piece was then added with more liquid glue. The March 2018 MMH Kit contains a 6" x 8" stamp set, 4 fancy word dies, 7 fancy shape dies, 4 sheets of black cardstock, 4 sheets of kraft cardstock, 4 sheets of white cardstock, sparkly sequins, Silver Sparkle embossing powder and a Unicorn White ink cube. The value of the kit is $70 but you can get it for an amazing $34.99 (approx. £27 depending on exchange rate). Remember the kits are limited edition and often sell out quickly. 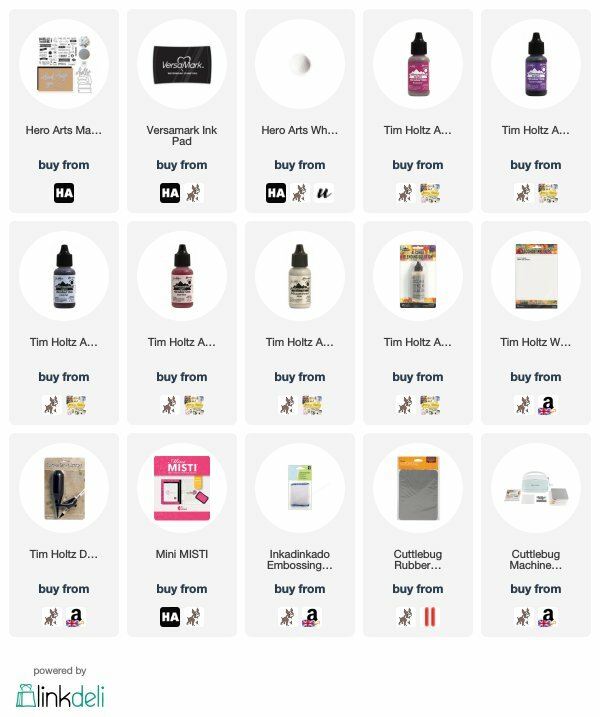 You can subscribe here so that you never miss a kit. International subscribers get a discount off shipping too! 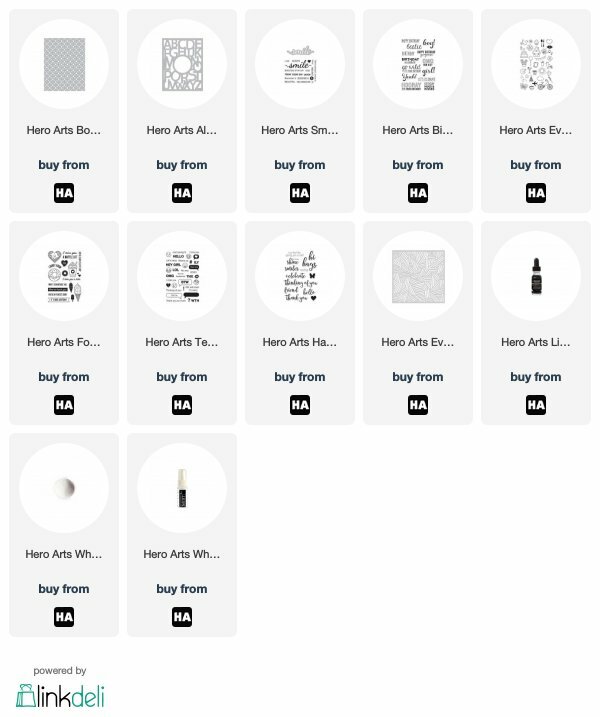 Hero Arts are giving away one kit to one lucky winner, selected from all the comments from all the blogs in the hop. The giveaway closes Sunday, 11th March at 11.59 EST and the winner will be announced the following week. If the winner has already purchased the kit, they will be reimbursed for it. The next person on the hop is the fabulous and amazing Laurie. Thank you so much for visiting me today. I hope you have a wonderful time on the rest of the hop and a great rest of the day too! Love the bright color background. Beautiful Card. Beautiful use of alcohol inks. Thank you for sharing. Beautiful card. I love purple. A beautiful card, Michelle! Love this kit. Beautiful card. I can't seem to heat emboss Yupo paper without warping it, no matter how fast I move the heat around. Great job! Your card is awesome ! I love you choice of alcohol inks. Beautiful kit and card! I especially love the word dies and the add-on background die. Very pretty with the strip of vibrant color. Beautiful purple background. Love the card. You always come up with beautiful card! The rich purples look amazing!!! Such pretty watercolors! I love the way you combined such vibrant colors with white. The alcohol strip is the perfect backdrop for the white die cut sentiment. Beautiful! Michele, your CAS card is amazing with the embossed background and alcohol inks. GORGEOUS! Thank you for participating in the hop - happy to have stumbled upon your blog! Your card is stunning. I love the made piece you created and against the white wow. Great embossed background die and sentiment. Love the mix of colors in your background piece - so cool! Pretty card! I'm really liking the new word dies! Fabulous card! The alcohol ink strip is gorgeous and a perfect resting place for the wonderful sentiment. Super beautiful card! Love the purple against the white!! So simple, yet so pretty. I love the details, the white, and the pop of purple is stunning. Just a lovely new release with so many ideas. Love the contrast of the color on the white embossed background! Just beautiful. Thanks for sharing with us on this fun blog hop. Amazing cards. Alcohol ink background are a favourite. I've long admired your work Michelle and this is no exception. It's so understated and elegant. Thanks for your continuing inspiration. So gorgeous! I have not tried this technique yet, but will soon! Thanks for sharing. Wow!!! What a lovely card!!! Ok - this is such a gorgeous card!! Love it! Love this clean card! That's my style and I think this kit is great for these kinds of cards. Beautiful card! I love how you used the die to emboss the background of your card. And the alcohol ink blending is gorgeous. Beautiful card! We love the purple alcohol ink background - sets of the rest of the white so nicely. Awesome kit and this card is great! Love that purple element. Beautiful card. I like the use of the alcohol ink background to set off the sentiment. I need to try that! Wonderful card! Love that purple strip! That purple is beautiful ! Beautiful card! Love the colors and textures! Such a beautiful, clean card! LOVE the strip of Yupo paper - really stunning! Beautiful CAS card, love the pretty thanks die cut and the alcohol inked piece. That purple is stunning! Thanks for sharing such great ideas! 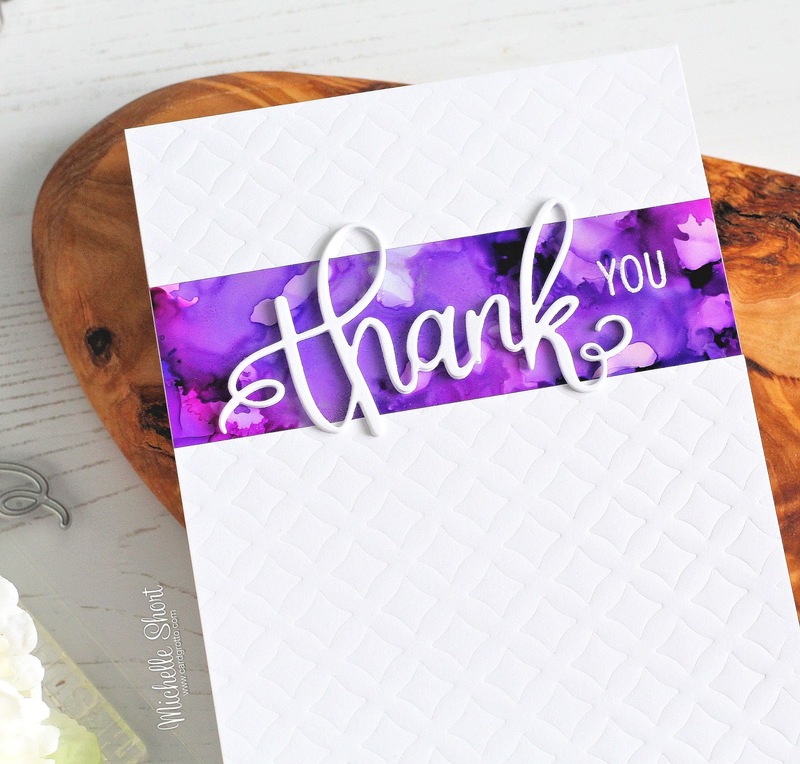 Love the dry embossing and that gorgeous purple backdrop for the sentiment! Siple but beautiful! Don't know if I can re-create your background technique but would love to try! Brilliant purple clean card, purple is a fab, it runs through my veins instead of red. Loving that new kit, hero arts. Very nice way of making the sentiment stand out. Love it! Can't help starring at this card. It's just stunning! 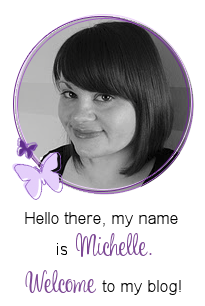 Michelle, I am so with you on, "I love the fonts on these word dies!" Great colors and technique! I can't wait to try this. Inspirational use of the Hero Arts release, as ever - it's a simply beautiful card. Love this card! It's simply stunning. Love your work! This card is simple and beautiful! These word dies are wonderful and love the pretty background you created on your card ! Beautiful card! I have no idea how much longer I am going to be able to resist getting alcohol inks! A beautiful thank you card!! The word dies in this kit are so lovely that you don't need much with them. You want them to keep the main focus. I love the background you created for the thank. Sonpreytty! Wow how beautiful!! Love the colors and look of the alcohol ink. That is so beautiful! I haven't tried alcohol inks yet, but you make me want to - such gorgeous, intense color! Love this and all your alcohol ink cards that you have shared lately. Wow the alcohol ink looks great! I make the panels and then what should I do with it. That thank die is very nice and I like that you made it several layers. I really love your CAS style !! I love how the white really sets off the alcohol ink panel. They both enhance each other and it's gorgeous! The sentiments in this month's kit are perfect! Simple, elegant, and just perfect. Thanks for sharing.